Devices are available to provide the 12 volts, negative ground that are needed for today's iPods, MP3 players, cell phones, etc. 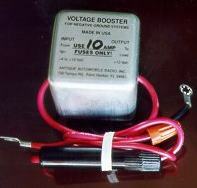 If you have a 6 volt negative ground car, you need a voltage booster. 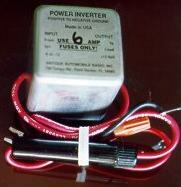 If you have a 6 volt positive ground car, you need an inverter. They are small (only a 1 3/4" cube!) so they can fit almost anywhere. Depending on the input voltage, the inverter puts out about 2 amperes and the booster puts out over 3 1/2 amps. So they are fine for alarm systems, radar detectors, CD players, etc. They are not intended for motors, solenoids, door locks, power antennas, etc. If you are unsure of your application use the Contact button to ask. For pricing see 'miscellaneous/pricing' header.